Mac Davis finished his AKC Championship with three 5-point majors plus two singles. He is pictured here on the day he finished when Judge Pete Dawkins awarded him Best of Breed from the Open Class. He was handled in Open by Ryan and then went on to take Best of Breed with Kathy on the lead. Mac Davis' first time in the ring was at the Flagstaff Kennel Club show. 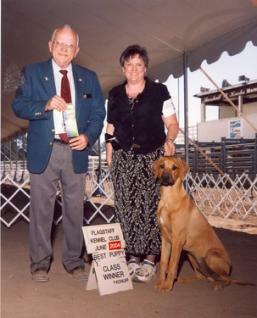 He was awarded first in the Puppy 6-9 Months class and went on to take Best Ridgeback Puppy. He was handled by his co-owner, Kathy Davis. Mac Davis at around 12 weeks old. 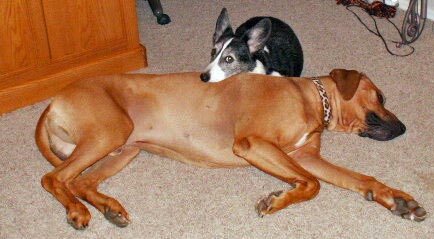 Bunny, the Cardigan Welsh Corgi, snuggles up to Mac Davis. Copyright 2007 - 2018 © All Rights Reserved.